Due to high demand ! Since Febuary, 2014 Aloha kayak Co. has been offering a 5 hour Big Island Kayak tour to Captain Cook Monument in Kealakekua Bay. This new tour gives you an extra hour more landing and snorkeling time time at Kaawaloa Point where the monument is located. Check -out is roughly 12:30 - 1:00 pm at Napo`opo`o wharf upon conclusion of tour. Check out time varies on size of tour. We operate this longer version on Sunday, Tuesday and Thursday Mornings only. Sorry No Afternoon 5 Hour Tours available. This tour not only allows you to really take your time and enjoy the incredible snorkeling that Kealakekua Bay offers, but will give you a chance to eat lunch and learn about one of the most historic sites in all of Hawaii Nei. This tour has lunch included with option of ham, turkey or vegetarian sandwiches and also includes individual bag of chips, pineapples slices, granola bar, and all the water you need to stay hydrated. Please have sandwich choice ready when making reservations. Location: 79-7248 Mamalahoa Hwy, Honalo Hi, 96750 at Aloha Kayak Co.
Equipment fittings, orientations, directions and other instructions and drive to bay. Guides set up to launch, at Napo`oo`o Wharf. Customers park cars in State Park and use restrooms, pack snorkel gear, etc. Kayak across Kealakekua bay to the Captain Cook Monument, with a high chance of seeing spinner dolphins. This is the core of your Captain Cook Monument Experience. We will guide you through the historical facts and sites that this special place offers.We will be snorkeling off the concrete dock in front of the Monument which is one of the most pristine eco-systems on the planet. We will eat our lunch on shore as well, which our exclusive permit allows. To learn more about our 3.5 hour Kealakekua Bay Snorkeling tours click here! 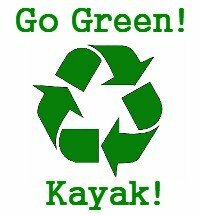 • Instructions, kayaking and safety equipment, chilled water and snacks. Snorkel gear and dry bag if requested. • Vehicles recommended for our tours. If you don’t have a vehicle call our shop for transportation options. • Transportation may be available for you through our staff to take you from our shop to the launch area. • Please call for availability and check-in times. • Lunch provided for all 5 hour Tours. Lunch options are Ham, Turkey or Vegetarian Sandwich with chips. Please have your lunch options ready when making a reservation. 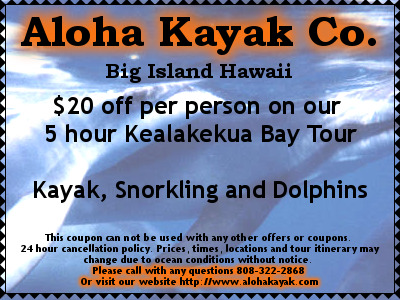 Aloha Kayak Co offers Our Premier 5 Hour Tour and an afternoon tour for this area daily. Please make advanced booking! Seating Very Limited!